Our extensive online catalogue delivers a wide arrange of high-quality and variety of imprinting products from top manufactures such as COLOP and TRODAT. Choose for your business or personal needs a custom logo, dater, addresser, and more! Our stamps are truly a stamp for any occupation and event! Customising has never been faster or simpler! Upload your own file design with a simple click of a button. Or try our user-friendly online generator which gives you the power to design your own stamp with a custom border, image, logo, text, and theme clipart. We care about your valuable time. All orders are received with fast delivery, with an added option of same day shipping if ordered by 14:30. Place your online order directly with us from your home or business today! Developed in Austria, TRODAT has become an international leading engineer in stamp production. TRODATs products are highly innovative and suitable for every sector and application. Choose the perfect product ranging from a mobile printy, clothing marker, address, logo and more, with a custom design to fit your every need. COLOP is a worldwide leading partner for all imprinting manufactures with modern design. With special lines such as the Green Line for environmentally conscious people, Microban Stamps with antibacterial protection, and more. COLOP has been a leader in quality standards and services for years, with many awards such as the Austrian State Award and Quality Seal to prove it. COLOP is truly the spirit of innovation. Our extensive catalogue delivers a wide range of products to fit your every business need. Choose from “booked”, “copied”, signature, address, logo stamps and more today! We offer a large diversity of stamps to help you create any innovative design. From birthdays, baby showers, or wedding projects, our vast selection will be sure to impress. Our imprints also make great tools for busy teachers with various images, wording and colour, while coming pre-inked and easily refillable! We offer top quality products for every sector allow for the perfect product for doctors, divers, teachers, DIY crafters, bankers, and more! Our homepage makes it easy to find our highest sector products such as school, geocaching, diver, and stamps for children. Creative playtime is a great way to jump start cognitive skills such as problem solving and spacial reasoning, and with our imprinting products it makes learning fun and interactive. Choose from a wide range of fun designs such as smilies, unicorns, animals, and more! 1. 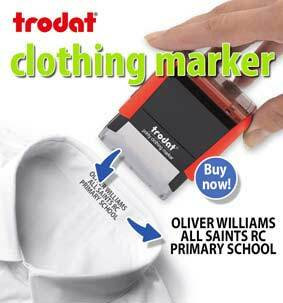 Choose from our extensive catalogue of high-quality self-inking products from leading international manufacturers TRODAT and COLOP. Pick from the perfect style for you need with integrated ink-pads, varying shapes and sizes, and colour options. Finding the perfect material such as metal, plastic, or wood has never been easier. 2. Choose from an extensive collection of date stamps from our COLOP Dater Green Line or TRODAT Printy Dater. Our exclusive daters allow you the choice of custom design, adjustable dates, multi-colouring, and more. Our dater stamps will not only enhance the aesthetics of your office or home but also offer a great option for imprinting every day of the year. 3. Wooden stamps give you the option for a highly durable product for a great money value. Our variety of wooden imprints are made from beech wood with a laser engraved elastic rubber plate. COLOP is known for its Green Line specially designed with recycled and sustainable materials, as well as CO2 Neutral. TRODATs Printy Line is made with climate-neutral materials. TRODATs rubber stamps now save up to 49 percent more CO2, than it’s predecessors. 1. What kind of stamps exist? Our vast catalogue gives you the perfect imprinting product for your every business or personal need such as: dater, signature, logo, monogram, and more! Choose from an array of different sizes, material, and inking styles. Our goal is to supply you with your perfect product in the utmost timely manner. Orders made before 14:30 will be produced and shipped the same day. All prepaid orders. Customer satisfaction is our top priority. That is why we only supply top quality products.. We also include free delivery on orders as low as £35 within the UK. Let us help you find that perfect design for your every business and personal need..
4. How to design stamps online? Customise your design easily with our user-friendly online generator where you can pick the perfect text, border, image/logo, and even clipart. Or upload your own file with a simple click of a button! 5. Can I choose the colour? We offer a range of different options from COLOP and TRODAT, that allows for ample of colour choices. 6. Can I upload my own theme? Our online generator allows for easy uploading of files and themes, or simply pick your desired theme with our diverse catalogue of clipart. 7. How can I pay and which payments exist? Payments can be easily made with a Visa and MasterCard credit cards, as well as Visa Elektron and Paypal. 8. Is there any equipment? We offer high-quality equipment to help keep you organised and efficient, such as our sleek stamp holder. We also have a range of high quality endorsing ink and ink pads with a range of colors.